For many, when planning and designing a greenhouse, heating is a factor that is often overlooked. A traditional forced-air heater and thermostat are all that one really needs, but is this method of greenhouse heating really the best solution? For commercial operations or greenhouses located in areas with more mild winters, the answer is often yes. 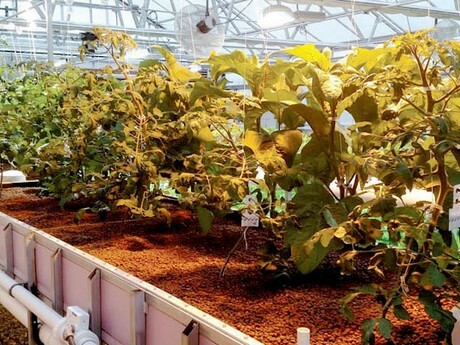 However, for hobby growers or those in Northern climates, there is a more cost-effective means of heating which provide both plants and growers with a number of benefits: radiant heating. Radiant heating systems work by radiating heat from a hot surface to cooler surroundings. In greenhouse applications, piping is installed under the structure’s foundation. These pipes are then connected to a hot water heater. When the hot water runs through the system, the air between the greenhouse floor and the structure’s foundation is heated. As hot air rises naturally, the heat can then be felt above the floor and radiates throughout the greenhouse space. This application is ideal for heating an entire greenhouse or for use as under bench heating to supply heat directly to a plants root mat. Perhaps the number one benefit of this heating system is that it provides gentle, uniform heat throughout the greenhouse. Even heat distribution results in fewer cool spots, meaning that more heat remains at the root mat instead of sporadically spreading throughout the greenhouse to fill cold spots. With steady heat, plants are able to thrive, making it possible to keep plants alive throughout the entire year or to start crops earlier in the season. Radiant heating is more energy-efficient than alternative methods, such as baseboard and forced-air systems. Traditional forced-air heaters heat from the ceiling down. This creates problems with air circulation and often results in the majority of warm air becoming stuck or escaping at the roof of the greenhouse. Baseboard heaters can heat a space too quickly and carry the risk of overheating crops. As these heaters sit at the bottom of the greenhouse, if crops are placed on a standard height bench or display rack, they may end up being too close to the heat source. Radiant heat systems supply heat to the space surrounding the crops, keeping heat levels uniform at any height. With uniform levels of heat throughout the greenhouse, there is no limit on the growing season. This gives growers the advantage of bringing out-of-season crops to market, leading to higher demand and increased revenue. This also provides an opportunity to expand to new markets with the appeal of fresh, reliable products year-round. This can bring in new clients, such as local restaurants and grocery stores. Once a radiant heat system has been installed, there is little maintenance involved and use of the system is very easy. As radiant heat works by supplying warm air to cold space, warm air is distributed evenly throughout the greenhouse. If enough warm air is present in a single location, the heat will radiate to a cooler section of the greenhouse to keep the levels stable. This prevents the worry of overheating plants, while maintaining a constant and stable temperature for the crops to thrive. These systems are built by design, meaning that design, application and more are completely customizable. Radiant heating can be installed under a greenhouse foundation to supply heat to the entire greenhouse, or can be installed under benches, offering heat directly to the plants root mat. If used under a concrete table or foundation, installing TekFoil Reflective Insulation can help reduce heat transfer loss. TekFoil Insulation helps to reduce heat loss through radiant heat transfer by up to 97 percent, meaning that small amounts of heat are used more efficiently, reducing operating costs and energy requirements.